Royal Residence Rangdu is located in the northern part of Bali on a rough piece of land of about 2 hectare, situated up-high, 210 metres above sea-level. One side of the terrain offers a broad view of the ocean, the valley and volcanoes and the other side offers a typical tropical skyline of a volcanic mountain area. Rangdu is an authentic small village, not yet discovered by tourism. 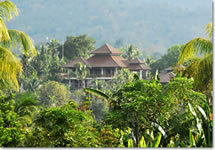 At this moment (2012) the Royal Residence Rangdu Resort consists of 7 exclusive Villas of which 5 are for rent. Beautiful villa's with enchanting gardens, including an ultimate five star full service, enabling you to instantly forget our hectic western society. A place to recharge your batteries and re-visit. The territory of Royal Residence Rangdu is shaped by the hill on which it is located. Its size is about 150 by 130 metres of rough ground. The east side of the area is steep and rises about 15 metres above street-level. For this reason it is not possible to reach this side by car. You will enter on the other side (west), where the territory is only 4 metres above street-level. The area consists of different terraces, all located on different levels. This offers a unique opportunity for a variety in construction and enables all plots of land to enjoy the beautiful scenic view and use the specific shape of the area to create surprising elements in the construction. The territory is vastly overgrown and is characterized by a large amount of mango trees, producing 5 lorries full of mango fruits per year. The terrain is located in Rangdu, a village between Mayong and Seririt (about seven kilometres from the coast at an intersection of two main roads). About fifteen minutes by car (going east) you will find Lovina beach, a touristic area (with various hotels, restaurants and shops) but still a relatively peaceful environment. Going further east for about a quarter of an hour, you will find Singaraja, the second largest city of Bali (about 100.000 inhabitants) and a former colonial governmental centre. The architecture of many buildings is strongly influenced by (Dutch) colonial style. The road from the village Mayong to Seririt (so also to Rangdu) crosses a relatively narrow offshoot of the volcanic mountain range, which goes right through Bali. On both sides you will see the deep valleys with streaming rivers. You will find everything for your daily necessities in Seririt, on the daily market places and in the local supermarkets. Along the coast (about 15 minutes away) you will find many beautiful snorkelling and diving locations. Famous are the dancing dolphins, who will surprise the tourists in small boats on a calm sea at seven oâ€™clock in the morning. Various touristic attractions and spots to visit are less than an hour by car, like the GitGit waterfall, hot water springs and Buddhist temples.